Sporteka has been nothing but a fun energetic social time for Charlie and its been like going to a party every session - without the rubbish food! I have appreciated the itinery of sports education. Great introduction to all the Sports. Thanks for providing us all with such a program. The Sporteka team provide an excellent experience. It's a terrific environment that is kind, supportive but also educational. I took my child there so that he would learn the basics in sports because it is skill well-regarded in Australian society. He now has a well-developed sense of how to kick and throw. My child made friends and enjoyed it immensely. He also liked the well-designed equipment that the Sporteka programme uses. My son loves the class and looks forward to it every week. 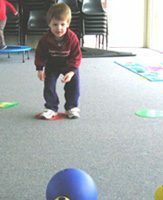 It is a great way for kids to be introduced to a wide range of ball sports, and really does improve coordination and listening skills. I couldn't recommend this program more highly. My 2 children love going to Sporteka each week. Its a great introduction to a broad range of sports where the kids get to interact which each other, and the parents choose how much interaction for your child - watching to helping your child with different activities. My daughter talks about it each week and she has been introduced to more friends outside the kinder group. You can see how the skills they practice at Sporteka are used by the kids in everyday life - without you having to tell them. Thanks Fatima, Sporteka is highly recommended from us. My daughter goes to Sporteka every week and because of all of the sports she has been exposed to, we have learnt a lot about what she enjoys most and particular skills she has that we would otherwise not have known about. She has particularly loved hockey this term! My son is only 2 and although not enrolled, runs around and loves it too and Fatima is very understanding when the younger siblings get involved which is really nice as it can so difficult to find activities where the younger siblings can run around and you are not made to feel guilty because they really shouldn't be participating. Sporteka is also non-competitive and more focused on the skills involved rather than the sports. My daughter's confidence has really improved and this is how Sporteka really delivers. I was always scared to try sports as a child as I was never very good and I didn't want this for my daughter, and Sporteka has given her the confidence to give anything a go and have fun!My daughter goes to Sporteka every week and because of all of the sports she has been exposed to, we have learnt a lot about what she enjoys most and particular skills she has that we would otherwise not have known about. She has particularly loved hockey this term! My son is only 2 and although not enrolled, runs around and loves it too and Fatima is very understanding when the younger siblings get involved which is really nice as it can so difficult to find activities where the younger siblings can run around and you are not made to feel guilty because they really shouldn't be participating. Sporteka is also non-competitive and more focused on the skills involved rather than the sports. My daughter's confidence has really improved and this is how Sporteka really delivers. 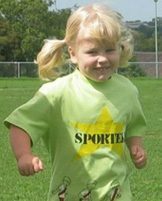 I was always scared to try sports as a child as I was never very good and I didn't want this for my daughter, and Sporteka has given her the confidence to give anything a go and have fun! I first came across Sporteka while reading the local newspaper. My son Royston wasn’t two and half but I was looking for a sports program that I he could participate in. I liked the idea of a multi sports program. So I rang Fatima we arranged a trial for Royston and we have been coming to Sporteka ever since. Fatima is a very passionate teacher. She is always patient and full of encouragement and my son adores her. Sporteka is a fantastic package. It is value for money, the duration of the lesson is suitable for young children, Fatima offers a variety of venues and times, the skill and sports taught are easy to apply and reinforce at home or outdoors and each child that attends Sporteka has a Personal Best Achievement Book with the child photo on the front. Royston loves his Personal Best Achievement Book he is very proud of it. At the end of each lesson the child get a sticker for skills they achieve during the lesson. Royston loves this bit and it motivates him to want to achieve more skills. Whenever people come around or after Sporteka when Royston sees his grandparents he always shows them his Personal Best Achievement Book and demonstrates the skills that he has learnt. Sporteka has allowed Royston to understand how different sports are played and it has also given Royston hands on experience of lots of different sports and equipment used to play various sports. 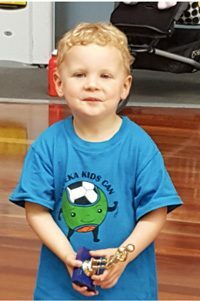 Sporteka has helped Royston learn so many skills of life such as hand and eye co-ordination, self confidence, balance, colours, sharing things, taking turns, listening, follow instructions, and working together as a team. Sporteka has also taught Royston the importance of warming up before playing sport and it has also motivated Royston to strive to achieve his best. Sporteka has definitely helped Royston to become a well rounded person, so for that I thank you Fatima. Himalini loves Sporteka. Himalini likes Sporteka because she is able to try various activities and games both indoors and outdoors. Himalini loves to run, and Sporteka gives her an opportunity to do that. As her mother I like the format where every week you concentrate on a particular sport such as tennis or soccer, but still in every class there is some time spent on the developing the basic skills such as running, throwing, and bouncing balls. It is reasonably priced and it encourages healthy living. The stickers, prices, certificates and trophies which are awarded encourage and reward Himalini’s participation and enables her to strive to achieve her personal best. As a mother of three young children in the 21st Century, it’s imperative to keep them active and away from the television or computer screen. There are numerous sports and activities available; however it’s impossible to try them all to see which sport your child is interested in. This is where I found Sporteka ideal. The program is very affordable comparative to other activities and it allows children to learn the basics of different sports and activities and hone in on those they are interested in. 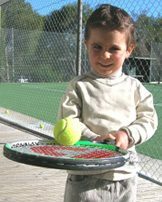 My youngest son, Paddy (3 years) initially joined Sporteka whilst my eldest son, Jacob (4½ years) joined a tennis program. During the first term, Jacob attended Sporteka as a “once off” and never looked back. He wanted to pull out of tennis and continue with Sporteka. Both boys have been participating in Sporteka now for just over six months and I believe that the difference in them is phenomenal. They have always been sociable and play well with other children; however since they have been participating in Sporteka their gross motor skills have improved dramatically, as well as their interaction with other children in a team environment. The program is flexible depending on the weather. On days when it’s inclement, activities are set up indoors which occupy the children accordingly. On more accommodating days, activities such as tennis, relays, soccer and other outdoor sports are conducted. 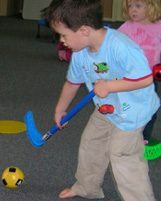 This allows the children to experience a broad spectrum of sports / activities. Fatima organises each session in a way that is safe and stimulating for the children. She has so much energy and is able to keep the kids active and interested so they enjoy every minute. She has great control of the group and takes an interest in their personal likes and dislikes, not to mention their strengths and weaknesses. The atmosphere is always positive and constructive and both my boys always feel included and encouraged. I was really impressed with the presentation medals and certificates that were presented to each child at the end of the year. In particular, I noted that both my boys’ medals had different images on them. Jacob’s had a soccer ball whilst Paddy’s had a tennis racquet / ball. This indicated to me that Fatima had taken the time to think about each child’s strengths / interests and presented them with a medal reflecting this. Two months later my boys are still showing people their medals and telling them they got it from Sporteka because they’re “good at soccer or tennis”. I really recommend the Sporteka program for any active child. Fatima is a dedicated professional who has taken the time to research the sports she instructs on. Thank you Fatima for creating a wonderful concept. I have two very happy boys who are showing more interest in getting out and kicking / hitting the ball then wanting to watch television or play the computer. It’s your enthusiasm and encouragement that keeps the children wanting to come back each week. Keep up the good work. When my son Jaden turned 2 1/5 I was looking around for a new activity. We had previously joined several programs but I was looking for something that would combine fun, play and also learning basic skills in various ball games. I joined Sporteka and found that it is a really great program for young children in which they can develop an interest in sports while playing and having a lot of fun at the same time. You find that Sporteka has a great variety of equipment as well as ample outdoor and indoor space that allows the children to try out a variety of ball games such as soccer, basketball and tennis. They learn the basic skills required for these sports while at the same time they build up their confidence when showing, what they have learned in a section called “Show and Tell”. The classes take place in a very friendly atmosphere in which the parents or grandparents and instructor help, participate and encourage the children. Compared to other programs I found Sporteka to be extremely well organised and to have a keenly motivated instructor ,who has developed a great structure which includes warming up to popular songs like “The Wiggles”, and a reward system in form of a personal best achievement book. Jaden for example developed a great interest in soccer and also loves to compete in the obstacle races with the other children. It is a good way to find out where your child’s interest lies. It is also a very affordable alternative compared to similar programs and gives you great ideas for games and playtime at home, which does not require much equipment. You will find Sporteka to be a very fun and rewarding program for you and your child. Jaden can’t wait to go every week! “My Son, Tyler, and I started going to Sporteka during 2004 when Tyler was about 2½ and we have continued to date, Tyler is now 4½. We have found this program to be a fantastic learning and fun experience for both of us. Tyler has learnt sporting and participation skills that I would never have had the time to teach him one on one, such as bouncing and catching a large and small ball, hitting a tennis ball over a net with a racquet, how to take turns with other children i n particular activities, what it is like to compete against other children (eg. running races) and how to participate in team activities (eg. basketball). All of these activities that we participate in are conducted in a safe and controlled environment – with such a variety of excellent equipment for the kids to use.] 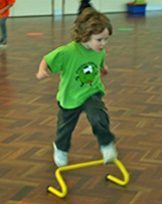 Sporteka has a great family friendly atmosphere – my 2 year old daughter is able to run around and play with the equipment etc. without the feeling that she shouldn’t be there. Our son asks us every day, "Do I have Sporteka today?" He loves learning the skills of such a variety of sports. We can't go anywhere without taking some sort of ball. We love Fatima's emphasis on children having a go, team play and building confidence of every child who's enrolled into Sporteka. We are fortunate to have Fatima such a passionate teacher to help our son to find the love in sport that we both have. I have had my son in Sporteka classes for two terms now and we joined for two reasons. One was because Charles is a very active child and the second was for a regular period of contact between Grandfather and Grandchild without Mum. This is working wonderfully and is helping Charlie to become more independent and learn that he does not need Mum around to have fun. Charlie loves the positive and friendly atmosphere of Sporteka. He seems to be growing both physically and mentally in an environment which keeps him stimulated and busy. The personal best achievement awards which Charlie receives in his own book are quite a highlight. Every visitor to our house is shown his collection of achievements and awards. It is also a useful tool at home to review class activities and practice new skills which he can present in the class show and tell. The facilities provide variety for the children, some activities being run indoors and others outdoors. The equipment provided is of fantastic quality and variety and of a standard that Charles can use to its full potential. Fatima has a lovely caring approach to the children and some of her key phrases have become a staple in my Sons vocabulary. For example, “Lets do it”, “Time for exercise” and “Ready set go”. My daughter loves Sporteka with her favourite activity being the scooter board. Every two weeks there is a new sport to learn, with Fatima keeping warm-up activities the same so the kids have some familiar parts and some new things. I am constantly amazed at how good all the kids are at hand-balling, hitting with racquets, playing mini golf etc. My daughter continues to practice at home and makes the whole family put their hands in and do the Sporteka chant and shake hands afterwards - it is great the good sportsmanship is being taught at this young age. I think it is a great acitivity that teaches them a lot of skills such as co-ordination, ball skills, team spirit and supporting each other and would highly recommend it to all. 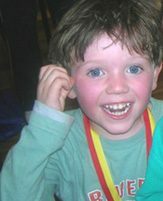 Our son Patrick has been attending Sporteka for most of the year and has benefited greatly from it. He looks forward to Patrickparticipating every Sunday where he learns something new every week while having fun. He is never bored as each week the program is different including a variety of different types of equipment to use. Some weeks there are indoor activities and some are outdoor.Patrick particularly likes the tennis sessions and often comes home and plays all week. Before he started he didn’t understand the concept of waiting for his turn and being a team player, we are now pleased to say that he waits his turn and believes that the rest of the team are his friends.The venue is excellent and the environment is very family friendly. Fatima is always flexible in her approach with the children and makes sure everyone participates and has a good time.We are very happy that we chose Sporteka and so is Patrick! With my children being so active, I never imagined that I had to teach them how to bounce and catch a ball. I thought that came naturally. Attending Sporteka on a weekly basis and being introduced to a variety of ball handling skills, sports and fun activities, I can see my 2 1/2 and 4 1/2 year old daughters becoming more confident and participating in team activities. The 50 minute sessions are just the right length of time to keep all the children enjoying themselves whilst learning new skills at the same time. My daughters practice the skills they learn during the week without even realising it. They love to ‘point and throw’ into the rubbish bin and hockey matches with Dads freshly washed socks rolled into balls are regular occurrences in a once sport-less house. 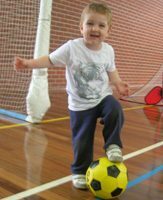 Our son Max has been attending Sporteka for almost 12 months now and he just loves it. 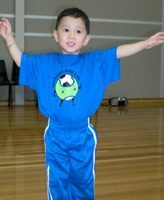 He began at 3 years of age with little or no ball skills and now he is confident in lots of activities including catching and bouncing a ball, hitting a ball with a racket, throwing a ball through a basketball ring as well as many more. Every week at Sporteka there is a range of activities for the children to participate in including tennis, soccer, basketball, general ball skills, warm up exercises and team sports. There is also a huge range of bright, colourful, new equipment for the children to use. As well as the activities, other things are incorporated during the session including learning colours, waiting for turns, balancing, music, co-ordination, listening skills, team work and hand-eye co ordination. There is always a lot of positive reinforcement during the session too. Fatima takes time out during the class to help individual children improve on their skills. All children have their own ‘Personal Best Achievement Book’ that includes recognition stickers for what they have achieved during the class. Parents are also encouraged to participate during the session when needed. Another advantage of Sporteka is the availability or being indoors in poor weather and going outdoors on nice days onto the tennis court. The children love going outside on beautiful sunny days. Our Sunday mornings are eagerly awaited every week. Max always looks forward to another fun filled session with Fatima at Sporteka! Our son Lawson started Sporteka at the start of this year when he was just over 2.5 year old. Straight away it was clear that attending Sporteka would be more than just about learning ball skills. He has developed the ability to listen and follow directions, wait his turn and really feels part of a team. He loves Fatima and talks about her regularly. She shows incredible patience with the kids and obviously loves what she does. What I’ve found amazing is that as the year goes on the kids are able to follow through on technique and resist the urge to just whack or kick the ball unrestrained! Outside the skills learnt they also have a lot of fun with a different end activity each week and Lawson loves warming up to music and the obstacle course at the start. 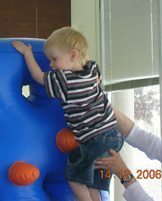 Sporteka has helped my son enormously. 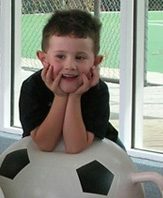 He started at age 3 and it helped so much with adapting to kindergarten.The music, interaction with other children and focus on sports that could be played at other times. Even though at times he didn’t want to go, preferring to stay at home and play with his toys and even though there were times he just sat on the side watching the children, he now loves it enormously. Fatima, Tawfek gives her all, her kindness, flexibility amd devotion to this is what makes all the difference. The pleasure in watching a child first bounce and catch a tennis ball, or hit one with a tennis racquet is immeasurable. I can highly recommend this program to anyone who wants to encourage and watch their children given opportunities to learn different skills. In an age where childhood obesity is so rampant, the encouragement of sport as fun and exercise as an enjoyable pastime is paramount. Well done Fatima.